Brilliantly colorful, intelligent, friendly, and loaded with personality, the sun conure has long been popular among families fond of companion birds. But owners should be prepared for one of the loudest of all the medium-sized parrots. The sun conure is also known as the sun parakeet. The taxonomical name for the sun conure is Aratinga solstitialis. The sun conure is native to northeastern South America, including Venezuela, northern Brazil, and Guyana. Found mostly in inland tropical habitats, the sun conure also may inhabit dry savanna woodlands and coastal forests. They usually inhabit fruiting trees and palm groves. This brilliant bird is currently endangered, with population numbers dwindling rapidly due to loss of habitat and trapping for the pet trade. It is estimated that roughly 800,000 are trapped each year, even though import into the United States was banned in 1992, and import to European Union nations was outlawed in 2007. Purchasers are advised to make sure the bird they buy is certified as captive-bred. The sun conure is a medium-size parrot; mature birds are about 12 inches in length, from the beak to the tip of the tail. On average, they weigh about 4 ounces. In captivity, the sun conure can easily live 25 to 30 years. The sun conure is a playful, amusing bird that enjoys athletic tricks. In general, it is a very affectionate and even cuddly bird that is gentle to all members of the family provided they treat it well. It is easily trained. The bird is not without assertiveness, though; it can turn aggressive suddenly if it is provoked. The sun conure is extremely loud, capable of emitting ear-piercing screams. In the wild, this call is used to communicate to other birds miles away; in captivity, it may elicit return calls from angry neighbors. This is not a bird for apartment or condo dwellers. Conures are not shy birds and will let you know if their needs are not being met. The loud, shrill call is used to bring attention to important situations, and many birds have been known to become excellent "watchdogs." At maturity, a sun conure is a bright orange and yellow bird with traces of green and blue. Juvenile sun conures are not nearly as colorful as adults—this is a natural defense mechanism. The first feathers are olive green in color, changing to a mixture of yellowish-orange at around six months of age. Full-color plumage can be observed at approximately one year of age. Sun conures have black beaks and feet, and characteristic white patches around each eye. The sexes are identical in color and markings. The sun conure is an active bird that will be happiest in a roomy enclosure; at a minimum, give it a cage 20 x 20 inches in footprint with a height of at least 36 inches. Make sure the cage has fairly narrow bar spacing (3/4 to 1 inch) to prevent the bird from getting its head stuck. A play gym on top of the cage is ideal, as this is an athletic bird that loves to create its own tricks. The sun conure is less fanatical about bathing than some parrots, but most will splash about and bathe daily if the cage has a bowl of clean water each day. Conures do not like spray showers as much as some other parrots do. As is true of most other parrot species, the sun conure needs safe out-of-cage areas to explore and investigate. Like all parrots, sun conures are social birds that need a considerable amount of interaction with their human owners in order to be happy. The sun conure is naturally playful and affectionate when it gets the attention it needs, making it especially suited for those who want a bird for steady companionship. Like most pet birds, sun conures require training if you want to have a positive and fun relationship with them. Positive reinforcement techniques can be used to train this parrot to a number of athletic tricks; the bird will not respond to scolding or any kind of negative reinforcement. 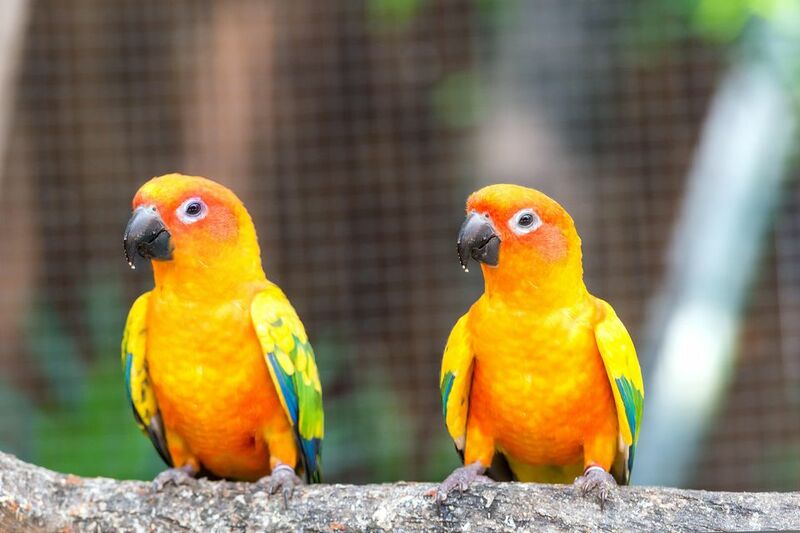 Sun conures are not known as talkers, but some birds demonstrate an uncanny ability to mimic other types of sounds, such as doorbells, microwave buzzers, and telephone chimes. In the wild, sun conures primarily feast on fruit, nuts, and seeds, but in captivity, they do best on a balanced diet. This companion parrot thrives on a diet that includes a basic parrot mix supplemented with fresh vegetables such as leafy greens, and root vegetables. Sweet potatoes slightly steamed are a wonderful food for your pet conure. Like other companion birds, a sun conure needs and appreciates treats, so don't forget to feed your bird food she likes but make sure they are healthy choices. If you would like to make feeding your new companion easier, try making a Grain Bake for her. And nuts are always a good choice for a treat—walnuts and almonds are excellent selections. And don't forget the occasional offering of fruit. As with all birds, proper exercise is imperative to good health. Sun conures are by nature very active and need to be provided adequate space to fly, explore, and play. Keeping this in mind, your sun conure should be allowed several hours out of the cage each day. Foraging and other forms of enrichment are essential for these intelligent birds, so make sure to provide them with a variety of interesting toys, and change them at regular intervals to prevent your pet from growing bored. Like other conures and parrots, the sun conure can be prone to feather picking. Although this may be caused by medical reasons that should be investigated, more often this is a sign that the bird is bored or is not receiving the attention it needs. Conures are also prone to Proventricular Dilatation Disease (PDD), Psittacine Beak and Feather Disease, psittacosis bacterial infection, beak malocclusion, and aspergillosis fungal infection. Have an avian veterinarian perform regular checkups to catch these problems in the early phases.